That is something I have always believed in and I have never stopped running towards my goal. I took my first ride on a bike, when I was in 7th grade. It was an electric bike by which I was not breaking any law. However, this is where it all began. My father planted the seeds and today it has bloomed into my biggest passion. I got to know about the real racing when I was in my late teenage. I used to watch my friends race which in turn cultivated great passion in me towards racing. I used to watch and admire every move of the champions and got inspired by their aggressiveness and adrenal. As years passed I was quite familiar among the champions. One fine morning I received a call from my friend saying “AHURA RACING TEAM” is conducting a “TALENT HUNT” for the “INDIA’s FIRST WOMEN RACING TEAM”. This team is initiated by Mr.Sarosh who was inspired by his mother to form this National Women’s racing team. The moment I got this a call, it sparked me to get my own car. The qualification day arrived and I was too early for the racing track eagerly waiting for the qualifications to take place. As I was curiously waiting, there came a bus with around 67 women. I was freaked out but on the other hand I was glad that so many women had turned up for the qualifications. Unfortunately, the day One was not mine as I marked my lap timings with 67th rank. I was still continuing to push myself until the last day of the qualifications and I finally ranked 3rd and the Ahura Racing Team had shortlisted 26 women out of 67. Further, the top 6 selections began and we had only three laps to prove it. In the 1st lap I spun, 2nd lap it did not go well and in the last lap I pushed it to the best of my abilities. During the final lap, I ranked 4th among the top six qualifiers and I made it! 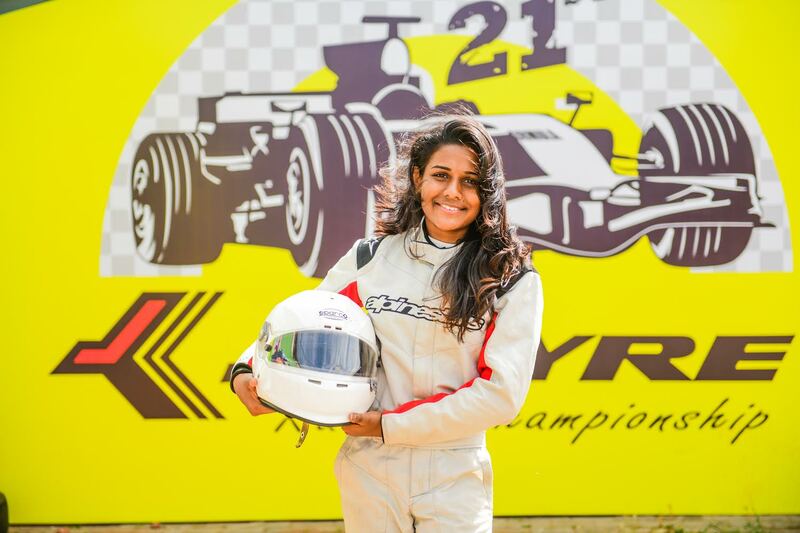 I was overwhelmed with joy and I got a call from my boss Mr.Sarosh and he said, “You are in the official team and you are racing in the JK Tyre National Championship 2018 “. Now, I was one among the racers that I had admired. 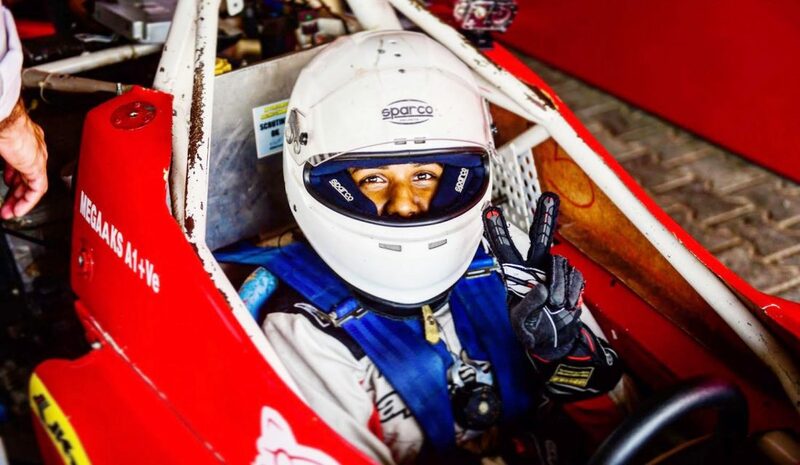 The weekend arrived and in just about 30 minutes before my first race I had got a call saying, “Hi Megaa, I am Narain Karthikeyan here. I am proud to see you racing in the JK Tyre National Championship 2018 “. That was the moment where I discovered myself and felt proud of everything I did to feel on top of the world. Then the National race event took place, where I was placed FIRST in all three races among the girls and had a decent finish overall. I raced along with the champions who ignited the passion in me. I have something to tell everyone out there who is not satisfied with what they are up to. Earlier, I used to be someone who was a nobody with not much goals to accomplish. All you have to do is trust in yourself like nobody can, be for yourself, you can be the best motivator to yourself, one day will be yours like today is mine. I am here and you too will be here soon! So, where do I come from? I was born at Mysore, Karnataka and brought up in Coimbatore, Tamil Nadu. I did my schooling at Stanes Anglo Indian Higer Seconday School until my 10th grade and switched to GD Matriculation School for my 11th and 12th grade. We are a family of four. My father is a doctor, Dr. K.M.Selvaraj and my mother K.Ganga Bhavani who had graduated law and is currently a home maker. My elder brother Agilan KS has graduated his B.E. at Coimbatore Institute of Technology and is working in an IT firm, OneEmpower. Happy women’s day to all. This reminds us to be mindful of thoughts and actions.